If you are a fan of three-handed, hyper-turbo Sit & Go games, you are going to love the wild promotion Everest Poker has in store for you this summer. 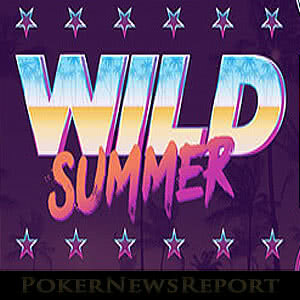 Everest Poker´s “Wild Summer” promotion is not going to be one for online poker connoisseurs, but it is going to be a lot of fun. It gives players of all skill levels and all bankrolls the opportunity to grab a prize during the summer months and potentially win up to €40,000. Like most promotions of the iPoker Network, Everest Poker´s Wild Summer promotion is a mission-based event, but it could not be any easier to complete. Furthermore, throughout the promotion, players can win extra prizes by simply playing their regular games and contributing to rake or paying tournament entry fees. There is only one buy-in – €0.50. Players are all-in every hand. Prizes of between €1.00 and €50.00 are awarded in the form of Twister tickets. In order to win a seat in the Wild Summer all-in shootout, all players have to do is play in a regular Twister game with a buy-in of €1.00 or more, play in an MTT with a buy-in of €1.00 or play fifty cash games of NL Hold´em (heads up excluded). Players will have to register manually for each shootout tournament, but do not have to be physically present to play in the game. Players also have the opportunity to win up to ten extra Wild Twister tickets every day by simply playing their regular games. Each time a player pays a combined total of €5.00 in rake and fees within a day, they will receive one €0.50 ticket for a Wild Twister game. Tickets do not expire for a week, so it is possible to save them up and have a major Wild Twister blowout. The way in which it is potentially possible to win up to €40,000 is a bit convoluted, but the opportunity genuinely exists. If you were to win a game of Wild Twister, you could be awarded a Twister entry ticket with a value of €50.00. Twister games have a top prize 1,000 times the buy-in (i.e. €50,000) of which the winner receives 80% of the pool. Like I said, it´s convoluted, but it is possible. What Else is Happening at Everest Poker this Summer? If you love your games of Twister, there is not better play to play than Everest Poker. In addition to the Wild Twister promotion, Everest Poker is continuing its weekly Twister Races promotion – an event similar to a rake race, only with points being awarded for the value of each Twister game entered, and double points awarded if you win the game. Every week, Everest Poker gives away €12,500 in cash prizes and Twister entry tokens to the top 250 players on its Twister Races leaderboard. There is no need to opt-into the promotion (or the Wild Twister promotion), leaderboard points are awarded automatically, and leaderboard positions are updated every two hours on the Everest Poker website. Do You Fancy a Wild Summer at Everest Poker? If you fancy a wild summer at Everest Poker, it is worth noting that the site is still offering a 200% bonus on first deposit bonuses up to €1,500 (maximum bonus) and still gives players sixty days in which to clear it. You can find out more about this exceptional offer in my Everest Poker review, or head straight to the site now to register your account and start your wild summer at Everest Poker today.